▪ A would-be bride in Indiana turned her own heartbreak into joy for her local community. Sarah Cummins, 25, was set to marry her beau at the swanky Ritz Charles hotel in Carmel. But when the wedding was canceled at the last minute, Cummins invited nearly 200 homeless day. ▪ True to her nickname, Julia “Hurricane” Hawkins, 101, set a new national record for the 100-meter dash last week as she stormed across the finish line at the USA Track and Field Outdoors Masters Championships. 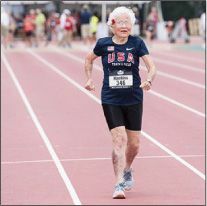 The Louisiana greatgrandmother was the oldest female athlet pretty nonchalant about her accomplishment. “I missed my nap for this,” said Hawkins after her heroic sprint.